Mystic Seaport Wedding Pics are typically depict scenes that are set along the Mystic River. Mystic Seaport is a village in Connecticut that is full of classic New England charm and is renowned as the nation’s leading maritime museum. The location is a living testament to the history of the area, and it provides couples with a beautiful space for Mystic Seaport Wedding Pics. 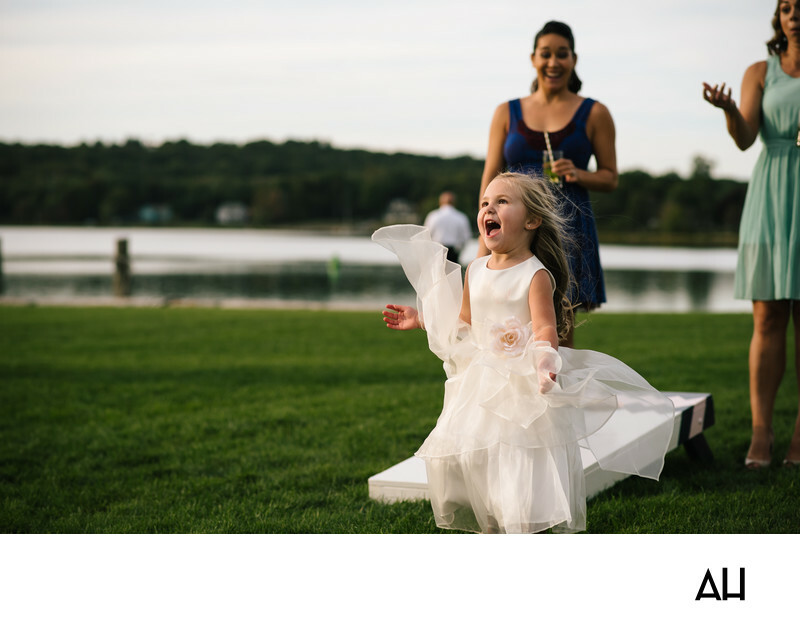 In this photograph from a Mystic wedding celebration, guests play games on a lawn area as the flower girl runs about energetically. The flower girl flies over the grass, enjoying the day with the uninhibited joy that only a child can display so fully. The women in the picture are in the midst of playing a popular tailgating game called Corn Hole, or Bags. The name of the game varies depending on the geographic location of the players, but the rules and the fun that comes from it remain consistent. The two ladies sip summer cocktails and laugh as they toss vibrantly colored bean bags and attempt to get them in the holes that have been cut into the wooden Corn Hole boards. As the camera flashed for this picture, one of the ladies had just released a bean bag into the air and to the surprise of the adults, the flower girl appeared. The little girl begins to reach her arms up toward the sky, hoping to catch the bright bean bag as it falls back to the earth. The flower girl’s dress blows about as she runs, her hair wild in the twilight of the evening. The child looks like a woodland spirit, dashing about over the grass, giggling and shouting in delight as she goes. She is a symbol of the pure, radiant fun that was evident throughout this wedding day.